The Great Cloth Diaper Hunt! It’s that time again! We are proud to announce our sponsorship of the seventh semi-annual Great Cloth Diaper Hunt™!How does the GCDH work? It’s simple! You register at http://www.diaperdecisions.com/pages/greatclothdiaperhunt.php on or after April 15, 2008. Then you visit all the participating sponsor sites and hunt for the Diaper Decisions™ diaper, to earn entries to the 65 random prize drawings, including Two Grand Prizes and one Ultimate Grand Prize!For more details about this great event, please visit the Rules and FAQ pages at http://www.diaperdecisions.com/pages/greatclothdiaperhunt.php . See you at the hunt! Yours truly is a sponsor! Check it out...you will find some FABULOUS new boutiques you probably didn't know even existed! Mothers Day is May 11th this year....it is always my busy time of year, so I am asking everyone that is wanting to order a gift to please do so asap. I am getting really busy and have now set my deadlines. You can see them by visiting my homepage www.mymommysbracelets.com. Gift certificates are always available and make a great gift if you are unsure which Mothers Bracelet or Grandmothers Bracelet to purchase. The best thing about gift certificates...you can order them up until May 10th and they will be delivered before "the big day" via email to either you or your gift recipient. I have added several new things and will be adding more this weekend. As always...if you have something in mind and don't see exactly what you are looking for please email me and we can make your ideas a reality. Also...don't forget about the SPRING FLING GIVEAWAY....there isn't too much time left to enter to win some of these fabulous prizes! 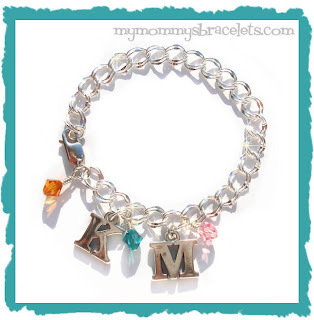 Enter by clicking the banner on my homepage www.mymommysbracelets.com. 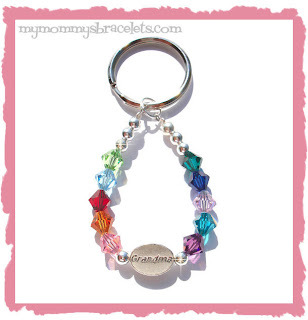 ANOTHER mymommysbracelets.com GIVEAWAY! This one is going to be even bigger and better than the last two...I have over 30 WAHM Mommy and Baby boutiques participating and you won't believe the awesome prizes that they are giving away! Check out some of the prizes...a springy tutu, a cute tutu dress, Mothers necklaces, web design goodies, diapees n wipees, bows, and tons of gift certificates! I am giving away 2 things...from mymommysbracelets.com I will be giving away a Mommy Bracelet. AND from Baby Girl Bracelets I will be giving away a Little Girls Swarovski Crystal Bracelet! A great way to get a FREE Mothers Day gift or even a gift for your little girl. GOOD LUCK...and spread the word! Here are a couple new things I have done lately. The charm bracelet was made especially for Colleen over at Classy Mommy and is available in the Mommy Bracelet category under the subcategory Sterling Silver Mommy Bracelets. The keychain was a custom order I really liked...so simple. You can find this keychain and others over in the Keychain section.